Everybody must have roasted a cauliflower, at some point in their life. Not me. Not until now. Roasted Bell Pepper - Oh Yes! But Roasted Cauliflower - Not yet! There is no specific reason as to why I have never roasted them. Its just didn't happen. But when I did, Sam declared that he is never going to eat cauliflower in any other way. Sid seconded him. It started a couple of weeks ago, when I had a severe allergic reaction and was covered from head to toe in hives. Apart from the burning sensation and the constant itch, what bothered me most, was my inability to cook. Heat from the stove top was unbearable. I had promised myself that I will not yield to the temptation of eating out. Eating out on week day would mean either Chipotle, or a Chinese takeout or a Pizza night. None of the options appease me. Not anymore. We had sandwich dinners, stuffed with either Tuna Salad or deli meats; slow cooker soups and store bought garlic breads. Store bought Rotisserie Chicken and the Salad bar at Kroger were life savers as was canned Sardines. Most of the veggies in refrigerator that week, was either steamed or dumped into the slow cooker along with beans to create hearty soups and stews. Sam rescued a cauliflower, which did not look half as pretty as the above pic. Cauliflower is a much loved veggie in our house but it mostly ends up either in stir fries or get curried with fish or shrimps. We never ate it in any other form. Not knowing what else to do, I simply sprinkled the cauliflower with dry spices (the ones that goes into my curries) and roasted it. Roasting brought out flavors that I didn't even know existed. The first time I made it, Sam and Sid ate it as if it was popcorn. They just couldn't stop popping one after another. I have made this thrice since then and every time I had to remind them that it was for dinner and not snack. This is a dry dish with the masala just coating the veggies. It is perfect side to a simple meal of rice-dal or dal-roti. It can also turn into an interesting salad, when served on the bead of baby spring mix with a light squeeze of lemon juice, with a sprinkle of toasted almonds or walnut for crunch and some cranberries for sweetness. 1. Preheat the oven at 500 F.
2. Wash the cauliflower thoroughly and pat dry. Cut into almost even sized florets. 3. Wash the potatoes and cut them into quarter. Keep the skin on. 4. In a larger mixing bowl combine the cauliflower florets, quartered potatoes, turmeric powder, red chili powder, cumin powder, coriander powder, ginger powder, salt and oil. 5. Toss them together using your hand, ensuring that the florets and the potato pieces are well covered wit the dry masala rub. 6. In a well greased aluminium foil lined cookie sheet, arrange the cauliflower florets and the potatoes in a single layer. 7. Put the cookie sheet into super hot oven. 8. Immediately lower the oven temperature to 400 F.
9. Roast for 15 minutes. take it out, flip the veggies and put it back for another 10 minutes. 10. By this time the top of the veggies would have turned slight golden with few dark golden spots. Test with a fork for desired doneness. The fork should be able to easily pierce the cauliflower and the potatoes. 11. Remove from the oven. Check for seasoning. Sprinkle more salt, if need. 12. Serve hot, garnished with finely chopped cilantro/coriander leaves. 1. You can use any kind or size of potatoes. Just make sure they are all of uniform size, for even cooking. also try to keep it the same size as the florets. 2. We first put it into very hot oven because the dry masala rub has salt in it and we do not want any moisture to ooze out from the cauliflowers and make them soggy. So the hot oven 'shocks' the veggies and seal in their moisture. The temperature is then lowered so that it can cook well in its own moisture. Cauliflower is very low in calories. 100 g of the fresh cauliflower head provides only 26 calories. It comprises of several health-benefiting antioxidants and vitamins in addition to be very low in fat and contains no cholesterol. Cauliflower contains several anti-cancer phyto-chemicals like sulforaphane and plant sterols such as indole-3-carbinol. Fresh cauliflower is an excellent source of vitamin C. It contains good amounts of many vital B-complex groups of vitamins such as folates, pantothenic acid (vitamin B5), pyridoxine (vitamin B6) and thiamin (vitamin B1), niacin (B3) as well as vitamin K. Further, It is an also good source of minerals such as manganese, copper, iron, calcium and potassium. 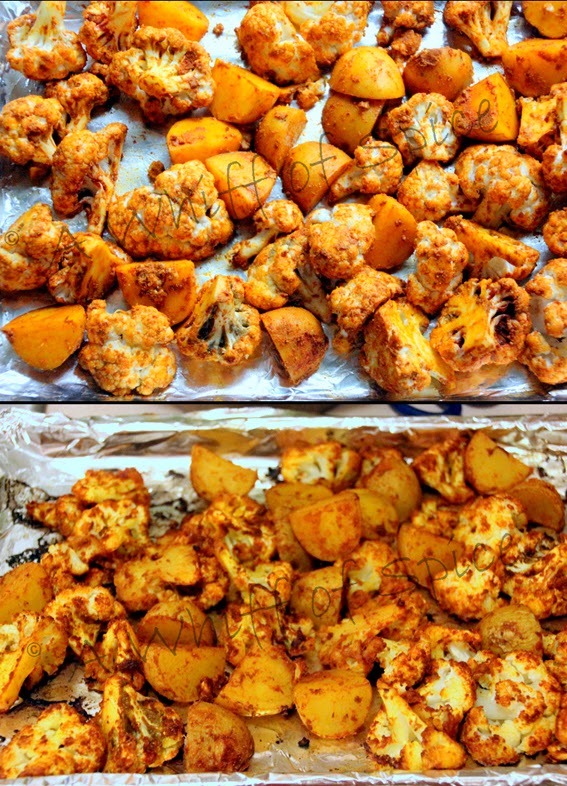 I love oven roasted cauliflower - but have always used just salt, pepper, oil and paprika. This spice rub looks absolutely delicious! Will try out soon! It is really delicious. But its pretty dry. Perfect side dish for our comforting dal-bhaat!